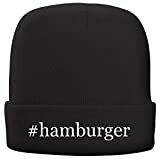 When preparing your next feast of gourmet Hamburger Helper, get a little helping hand from their infamous four-fingered mascot when you don this cool new Hamburger Helper Hand Hat upon your noggin. It also pairs nicely with that old Arby's Oven Mitt Mascot when baking. Come on, you know you want one!